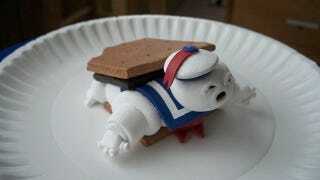 The great tragedy at the end of Ghostbusters is that all that delicious marshmallow goo went to waste. Sculptor Brad Hill reminds us just how tasty the giant Stay Puft Marshmallow Man would have been with his angry Stay Puft stuffed in a s'more. Hill has made a number of other delightful pop culture sculptures, including Fozzie Bear as Willy Wokka, a Christmas-themed Audrey II, and the cutest little Daft Punk robots ever rendered in clay.